Snowy days in The Netherlands | Memorable Days : Beauty Blog - Korean Beauty, European, American Product Reviews. It has been snowing a lot lately in The Netherlands and it's extremely cold, sometimes it's even -8°C here (FREEZING!) Besides it's slippery as well, I have seen so many people fall off their bikes or just when they walk >.<" (NOO, I didn't laugh at them, I'm scared of karma hahah) With this weather I usually don't want to go outside, I just want to relax at home and drink a hot coffee or chocolate milk ♥. However winter can be depressing. 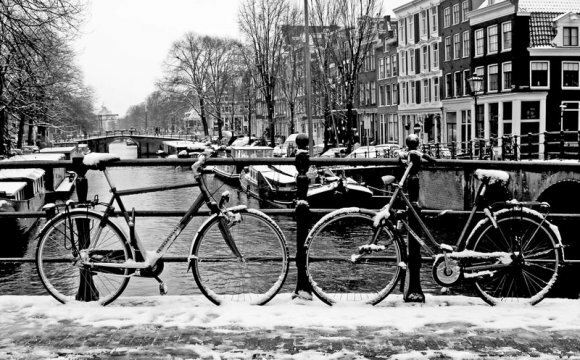 *Sigh this weather is making me lazy =(, I even skip class because of the cold xD that's so bad..
Winter can be pretty- snowy picture of Amsterdam :) Hmm.. Will we get a White Christmas this year ^__^? How is the weather at your place? @petitechouxx, ahww it's snowing here as well ^_^ but it's so coldd =( i dislike rainn ~~!